If you regularly find yourself bursting into an energetic song and dance routine every time your favorite song comes on the radio or playlist, then Musical.ly might be something worth exploring. With it, you can take your performance skills and creativity to the next level. Musical.ly is a free mobile app that allows its users to create and share music videos up to 15 seconds in length. Users can search for a music clip from millions of tracks available right through the Musical.ly app or they can use music from their device. 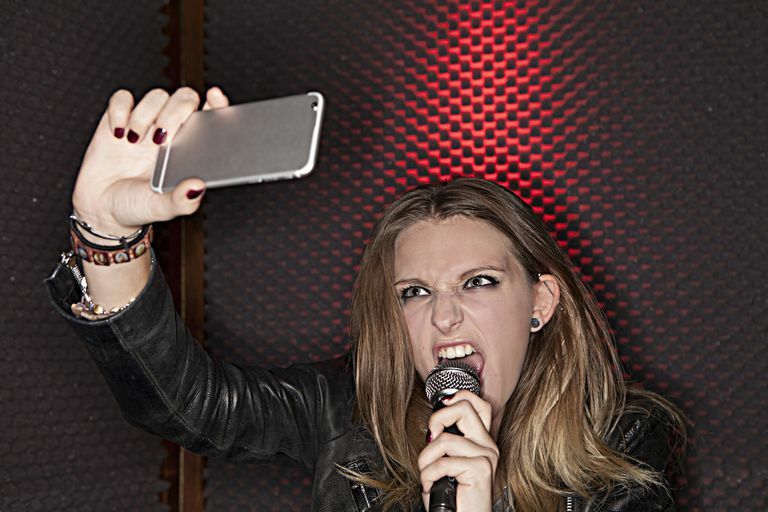 Once a song has been chosen, users generally record themselves singing through the clip using their front-facing cameras. Effects can be applied to videos before publishing to make them really stand out. On the social side of things, Musical.ly has a lot of things in common with apps like Instagram. In the menu found at the bottom of the app, you'll see a home feed tab that displays music videos from other users you follow, a search tab to see what's hot, an activity tab and a user profile tab. Musical.ly has an incredibly helpful library of songs to suggest for your music videos. Browse through collections of what's popular, lip syncing classics, comedy tracks and more. You can also use the search bar to find a very specific track. While this is hugely convenient, there's one major downside: There's no way to select which 15-second clip of the track you want to include in your video. You just have to work with the clip that Musical.ly gives you. The yellow button in the middle of the menu is what lets you get started with recording your first music video. You have the option to pick out a music track first, which will start playing as soon as you hit record (so you can lip sync at the same time) or alternatively you can shoot your video first and leave the sound as is or add a track after it's been shot. Holding down the record button all the way through your video can be a pain if you want to be really expressive, and there are a couple of ways to get around it. The first trick you can use is to hold down the record button and the X in the top left corner at the same time. The second thing you can do is tap the five-second timer button located on the right of your screen, which will start a five-second countdown to begin recording. Musical.ly is a very social place, and by visiting the search tab, you'll see a featured contest at the top, which you can click to view its details and participate if you like. You can also browse through the list of trending hashtags and consider getting in on the fun to increase the number of hearts you get and climb your way up the Musical.ly leaderboard. Musical.ly has another really cool feature that allows you to create a duet with someone you follow (who also follows you back). Just view an existing video of theirs and tap the "..." icon to pull up a list of options. Tap "start duet now!" and you'll be prompted to film your music video to the same music. When you're done, the preview will show a mix of clips between your video and the other user's video set to the same music. There's a lot more you can do with Musical.ly, and the best way to find out is by downloading it and experiencing it for yourself. You can get it for free from both the iTunes App Store and Google Play.